A pair of urban ecologists, one from Australia, the other Sweden, suggests in a Perspective piece published in the journal Science that it might be time to rethink the idea of the modern lawn. In their paper, Maria Ignatieva and Marcus Hedblom note that the natural benefits of green lawns are far outweighed by negative environmental consequences, and because of that, new forms of groundcover need to be explored. The expanse of cut green grass that surrounds many houses and serves as a draw to parks and other outdoor places is not as green as it might look. The modern lawn requires not only a lot of water, but fertilizer. It also requires mowing, in most cases using gas-powered machines that spew carbon monoxide and other toxins into the air. Ignatieva and Hedblom note that it is true that lawns offer some positive benefits such as pulling carbon dioxide out of the air, but the negative aspects of lawn care far outweigh their benefits. They note that globally, lawns currently occupy land space equivalent to England and Spain combined. Lawns also currently require an enormous amount of water—in arid regions, lawns account for 75 percent of water consumption. They also note that weed killers and fertilizers wind up in the water table. And artificial turf, they note, is not a likely solution. It doesn't contribute to carbon sequestering, causes problems with water runoff, and might be poisoning local water tables. Because of the obvious drawbacks, the researchers suggest that it is time for the world to rethink the idea of a lawn. They note that some communities have already begun to do so by allowing natural meadows in place of lawns. Such meadows, they note, can be made aesthetically pleasing by using grasses suited for the purpose. They also note that in some places, such as sections of Berlin, landscape has been allowed to grow wild. More realistically, they suggest research into plant types might result in the development of naturally short grasses that do not need much water to survive. In the end, they suggest that perhaps a combination of efforts might work. But for that to happen, people need to start reframing the mindset of modern groundcover. Golf courses are the worst. It seems like this would be an easy idea to sell--how many people actually enjoy wasting part of a day off cutting grass? Wildflower meadows are probably right for most people, but it seems like others might like recommendations for low care useful plants too. I used to live in an area where sweet potatoes grew like weeds, completely covering the ground. Rosemary, thyme, oregano and a few other herbs grew with no maintenance in another place. Fruit or nut trees might work in other areas. As a side benefit, it might help disguise the cookie cutter look of modern 'burbs. So I guess we need to engineer grass that doesnt need much water or fertilizer, and only grows so high. "The company's new, unregulated GMO grass requires less fertilizer, grows at half the speed of standard turf and is resistant to the primary chemical agent in Roundup, the weed killer made by Monsanto and sold by Scotts. That means gardeners can spray weed killers without worrying about it destroying their lawns. Trials are already running today. Scotts hopes the new types of grass will hit the market within three years." Well, lawn in hot and low rain environments is like growing tomatoes in desert. Nice find! Besides cutting meat consumption to half, we need efficiency too, according to the recent IPCC report. Immediately precision farming, GMO, and other methods comes to mind - we really need only 80 % of the current pesticides if we do it right, and GMO cuts that even further along with cutting land and so fuel use. The best ecological methods we have; I am sure there are more like those.. I haven't seen any better ground for sun bathing (sand is unproductive here) so some short grasses will likely be kept around. Nicku wrote "Golf courses are the worst." You are quite right. They attract pests like upper class rich people, CEOs and presidents. Ugh! We have a Xeriscape of natural plants, which is wonderful and ecological, fitting in with the native birds and wildlife. It requires very little water, if any. The point is it has managed without water, fertilizers, it grows in desert shrub, road side curbs, cracks in building, grows on rocks and rubble and if we stand on the lawn it grows beneath our feet and left to its own devices will uproot tarmac and concrete with no hose pipe in sight. @ granville: This article is not referencing the survivability of grass. Though what you say is true, it has no bearing here. This article is talking about our social use of grass and it's environmental impact, which is, obviously great. Here in St Louis, MO USA, for the past two years, I have, pretty much, wasted my time taking the garden hose out of the basement and putting it on the outside rack. I have only needed to water twice, in the spring and nothing else for the rest of the year. Normally, I would water the front lawn (40ft X 30ft) for 3 hours (single pulse sprayer) every 2 weeks and the back plot (40ft x 70ft) for 6 hours (single pulse sprayer) every 2 weeks. For the past 2 years, we have had so much off and on rain it even made it difficult to cut the grass. You can't cut wet grass, at least not without a commercial machine. Then, of course it keeps growing and gets harder to cut. Granville, that's a good point. However, you didn't even come close to that, in your first comment. pntaylor> Granville, that's a good point. However, you didn't even come close to that, in your first comment. This is more wide spread than most people realise pntaylor. Bees do not pollinate lawns. They are not talking about killing grasses, but getting rid of fertilized and watered lawns! Outsidepride White Dutch Clover Seed: Nitro-Coated, Inoculated - 5 LBS $25. Bacteria (Rhizobium spp.) living on the roots are the hidden agents that actually produce nitrogen together with clovers and other leguminous plants. The human body likes to see short grass so there can be warning of the lions and predators that are going to be hiding in the tall grass. It's wired into the deepest parts of us. We'll stop liking short grass around us when the animal core and native unconsciousness leaves our origins. As in: not any time soon. The further the tall grass is away from us, the safer and more relaxed we feel. Nope. I like the natural growth. I am not that scared. Get rid of lawns, cars, cows, private homes. Sure. People don't live just to exist, greenloons. You've never owned a house or a lawn, have you? Guess what happens to grass if it's left without care? I already told you we got rid of the lawn for a Xeriscape. Are you unable to read? Caring for the lawn is the reason we have to get rid of them, the fertilizers and water waste are too much in many places, polluting the waterways. Go to Florida the Republican state with the red and green tides of death. Take in a huge lungful. Cemeteries are a huge waste also. Get rid of them. George kamburoff's house is visible to all on google maps. He has room enough for a few potted plants. Note too the painted black squares on George's roof he calls his PV system. I have to agree with antigoracle, on cemeteries. They take a tremendous amount of land. Even though it is never spoken about, you will never convince me there is anything, even remotely, environmentally friendly about them. As someone else mentioned, golf courses are also a terrible waste of land and are an environmental burden. Time to quietly shed a tear. Not to dampen the spirit of a good cause! But - no lawns, no parks, no mansions opening their historic lawns and garden, no Newmarket sleek race horses on the 1000s of square miles of grazing for these special creatures, and finally when we shuffle of this mortal coil we cannot be laid to rest on the grass we played as a child, as in finality even our grave yards in our ancient church yards have succumbed to this green revolution, as long as it is not the green grass of yore. Time to quietly shed a tear. At least that will sustain that last blade of grass! It seems like this would be an easy idea to sell--how many people actually enjoy wasting part of a day off cutting grass? Autonomous lawn mowers are spreading and soon will be the dominant way to cut grass. They also use electricity, not fossil fuels, and they leave the cut grass on the field which reduces fertilizer needs. Couple that with GMO grass that will be resistant to droughts and most ecological issues with lawns will be solved. Xeriscapes look better and ARE better. Nobody is asking for a complete elimination of turf-grass, but it would be beneficial if there were a lot less, and if what there is did not get constantly watered, fertilized, and sprayed with pesticide. It's not normally necessary to do these things. If a lawn can't survive without constant watering, it shouldn't be there. 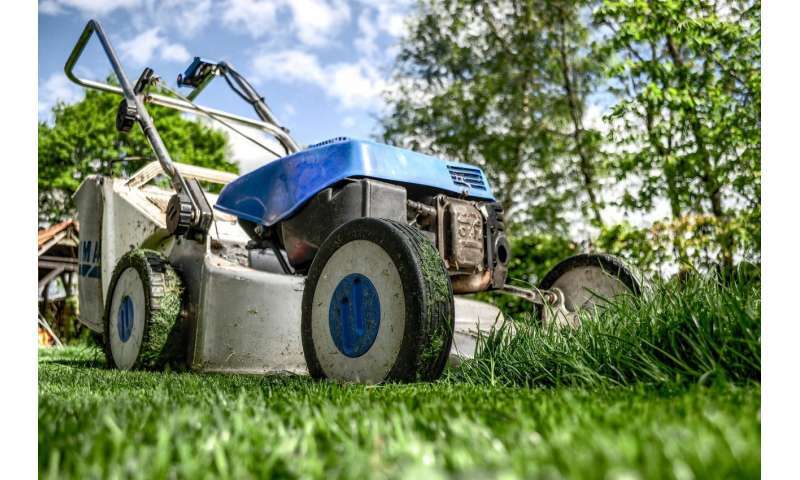 There is a lot that people can do to use less energy and water around their house from the way they mow, to how much or how often they mow, to the plants they use. A little education goes a long way, and there is a lot at stake. Belive it or not, some areas in the US require lawns even where it is not feasible to grow one. Local governments and "Homeowners associations" are part of the problem. My relative is constantly pestered to water his lawn during the dormant season of August to keep it green at all times even though it is natural for a lawn to do be dormant at this time. Many people here don't water or fertilize, or spray chemicals, but far too many do it regularly.